Angelfish are one of the most beautiful fish around. Their narrow slender bodies look amazing darting in and out of long thin plants such as the Amazon Sword and Jungle Val. 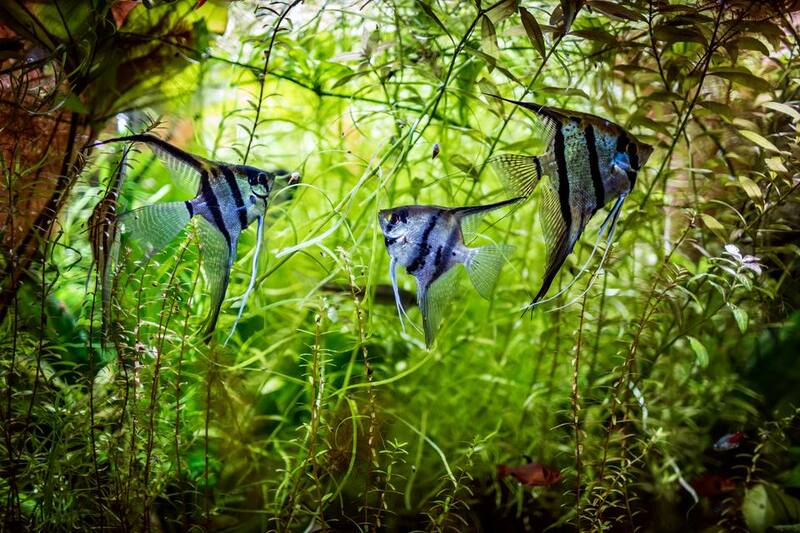 In the wild, angelfish (Pterophyllum scalare) are usually found in flooded forests and slow flowing streams. Their body shape and patterns have evolved to allow them blend in and camouflage with the plants in their natural environment, which is the main reason they pair so well with live grass-like plants. It's important to make them feel comfortable and give them the necessary plants for hiding in a tank setting. You can do this by replicating their natural environment and include a selection of live plants for them to swim in and out of. On top of using plants, also include plenty of driftwood and leaf litter to mimic their wild habitat. Any of the below plants can be kept with freshwater angelfish. To create the ideal setup, choose a selection of larger and smaller plants, and plant them so that the fish have plenty of open swimming space towards the middle and front section of the tank. Also be sure to surround the back and side sections of the tank with tall plants. The Amazon Sword makes an excellent background plant, or if planted alone it can make a great eye-catching central plant. This plant is easy to care for, and usually grows to around 12 inches in height. They have been known to grow up to 20 inches in the right conditions though, so depending on the size of your tank and the strength of your lighting, you may need to trim it regularly. In a low light tank, this plant will grow slowly, whereas in a medium to high light tank, it will grow rapidly. If you’re planning on breeding angelfish, this is a perfect choice of plant for them because they like to lay their eggs on blades of long leaf plants. If breeding is your main objective, plant an Amazon Sword just behind the middle of the tank, and then plant a taller species behind it to keep the eggs protected and under cover. To plant an Amazon Sword, make sure the roots are anchored well, but leave the crown of the plant above the substrate. The roots of this plant will grow wide and large, so make sure the substrate is deep. Considering angelfish feel at home in waters where there is plenty of cover from driftwood and leaves, Java Fern is an ideal plant to pair with both driftwood and angelfish. This slow growing plant can be attached to pieces of driftwood around the sides and towards the front of the tank. They can grow in a range of lighting and typically the higher the lighting is, the darker the green the leaves will turn. The leaves are hardy and have a leathery like appearance to them. They grow to around 13 inches tall and come in a few different varieties such as narrow leaf and needle leaf. Both of these variants are ideal for keeping with angelfish due to their thin leaves, which this breed of fish loves to swim in between. This plant shouldn’t be buried into the substrate; you’ll need to attach it to something else such as an ornament, decoration, or piece of driftwood. Secure the roots using black cotton, and after a few weeks the roots should have attached themselves to the object. This is one of the most natural plants to place in a tank containing angelfish. It's low maintenance and very cheap to buy. You simply need to plant a small bunch in one corner and it will quickly create a luscious jungle look on the base of your tank. This classic aquarium plant will do well in wide and long tanks, which are also perfect for angelfish. Vallisneria prefers a higher more intense light, however it will still develop even under low light, just at a slower rate. There are a few different species of this plant available. Vallisneria spiralis, also known as straight vallisneria or tape grass, is the most ideal live plant for angelfish due to its luscious green straight leaves which look just like tall blades of grass. 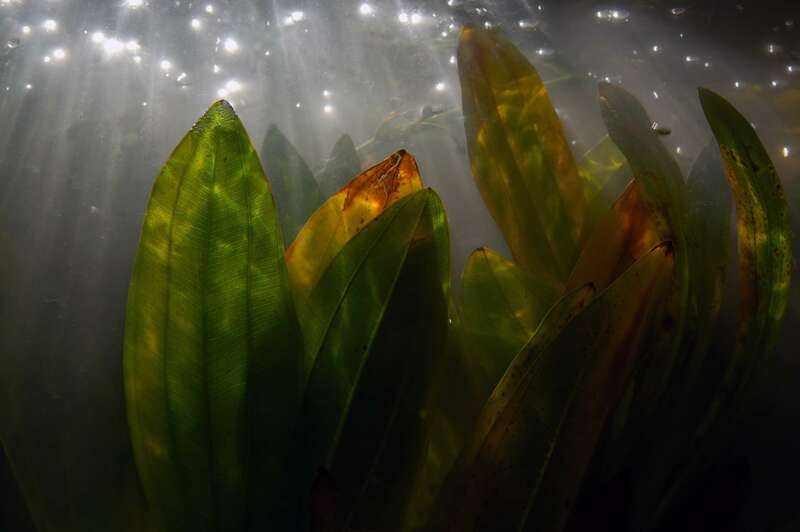 Another popular species is Vallisneria americana, also known as Jungle Val. The Anubias Nana is slightly different from the other plants listed here. Its leaves are shaped differently and it lies lower in the tank compared to other plants. While this specimen can planted directly into the substrate, it can also be floated. This will complement the other three varieties of plants well, rather than directly complement the angelfish. The other three species will grow tall and grass-like, providing plenty of space for Angelfish to swim in and out of, while this one makes a great covering for the front of your tank. This species grows quickly, and each specimen should be planted at least two inches apart. Be sure they are not planted in a shaded area as they need light. If you plant any of the other suggested plants, keep those towards the back, and this one towards the front. Hornwort can be planted as a background plant, and due to how tall it grows it would make an ideal pair for the Amazon Sword. If you’re planning on breeding angelfish, they’ll need a plant such as the Amazon Sword to lay their eggs on, and you’ll need another taller plant to provide shelter and cover for the eggs, Hornwort is perfect for this. Due to the rapid speed at which this plant grows, you will need to regularly trim it to make sure it doesn’t take over the tank.